Practice, practice, practice. That’s what it takes to become a great basketball player, but it isn’t always easy to find an open court. 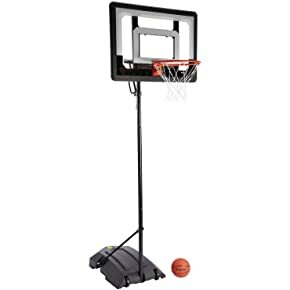 Fortunately, you can easily turn your driveway or yard into your personal practice court with a portable basketball hoop. These hoops are relatively affordable and easy to set up, and because they’re portable they don’t violate rules that many neighborhoods have about setting up permanent hoops. There are a lot of options out there when it comes to choosing a new hoop, but this article will make it easy to choose by giving pointers on what features to look for and highlight nine of the best portable basketball hoops currently on the market. Portable basketball hoops are affordable, but they’re still an investment – so you want to be sure you’re getting the right one for your needs and budget. Which means understanding the features that can make or break a basketball hoop. Having a well-built backboard for your basketball hoop is critical to your game – after all, it’s what you’ll be aiming the ball at most of the time! Most portable basketball hoops don’t include an NBA-sized backboard, but it is still important to think about backboard size. Smaller backboards, usually around 44” wide, are cheaper but can make sinking layups difficult. Backboards around 54” in size tend to offer a nice balance between playability and cost, while larger backboards are more professional but also correspondingly more expensive. The material of the backboard also matters for both play and cost. Plastic backboards are cheap and virtually indestructible, but have very little rebound – that is, the ball doesn’t bounce back as well as you would expect. Acrylic is the material for many mid-range backboards, since it provides a nice balance between rebound, professional look, and cost. The most professional backboards are made of tempered glass, which has a springy rebound and, unlike acrylic, won’t scratch over time. However, it is also expensive and heavy, requiring a larger support base. Think every rim is the same? Not true! Rims come in two different varieties: standard rims and breakaway rims. Standard rims are, as you might expect, simply a rim screwed directly into the backboard. These are cost-effective, but due to their stiffness can result in a high number of in-and-out bounce shots and trying to dunk on them can severely damage the backboard. Breakaway rims, on the other hand, add springs between the rim and backboard that dampens vibrations to produce less pronounced rebounds and enable dunking. 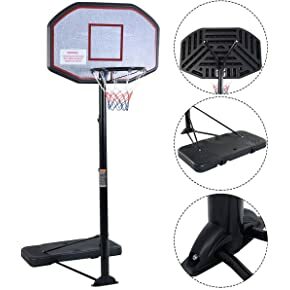 Less exciting than the backboard and rim, the base and support pole are nonetheless essential pieces of any portable basketball hoop. The backboard material will largely determine the size – and thus weight and stability – of the base, but if portability is important to you be sure to look for a base with wheels. The support pole is important because it controls how the hoop adjusts in height. If you expect to be adjusting height frequently – for example to practice dunking or if you plan to play with children – look for a hoop with a support pole that offers an easy-to-use jack-screw system and a wide height range. On the other hand, if adjustability is not important, a support pole with a simple screw knob with holes at 6” intervals is often more affordable. Acrylic backboard is built with premium materials to provide rebound rivaling that of a glass backboard and features a 1” steel frame all the way around. The breakaway rim is extremely durable, yet feels solid when contacted, making it perfect for practicing aggressive dunks. Height adjustment mechanism, with range from 7.5 to 10 feet in height, is very easy to use. Extremely sturdy no matter what the weather thanks to a wide base that can hold up to 200 pounds of sand or 19 gallons of water. Available in both 54” and 60” backboard sizes depending on your budget and available space to play. 16” offset between the backboard and base allows for plenty of area to play under the net or to practice layups. Acrylic backboard will develop white scratches over time that diminish the professional look of the hoop. The hoop is initially difficult to set up, in part because the included instructions are very poor and do not match all of the pieces included in the box. Somewhat expensive compared to many other hoops with acrylic backboards. 60” tempered glass backboard provides a huge area of play off the backboard, rivals professional hoops in the degree of rebound off the glass, and will not scratch after years of use. Backboard is stable during aggressive play thanks to a four-point mount holding it to the main pole. Height adjustments, from 7.5 to 10 feet in height, are as quick and easy as pulling on a lever thanks to a simple screw jack mechanism. Integrated handle and wheels around the base make it easy to move the hoop around, yet a 50-gallon base keeps the hoop sturdy under any play conditions when filled with sand or water. Integrated handle also serves as a built in rebounder for shots that drop through the net. Installation is difficult and likely requires two people due to the hoop and backboards’ weight. 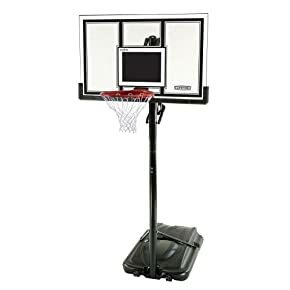 44” acrylic backboard provides enough backboard room to practice simple layups and is sufficient for pickup games, without taking up a huge footprint or burning through your wallet. Breakaway rim includes a dual spring system, enhancing durability and stability when dunking or rebounding. 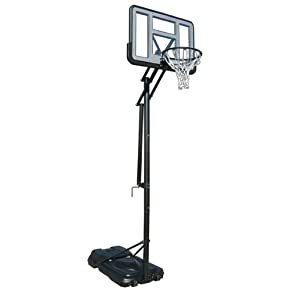 Height is adjustable from 7.5 to 10 feet, on par with the most expensive portable basketball hoops. When filled with sand or water, the 33-gallon base is more than sufficient to keep the hoop stable even during aggressive play. All-weather net will stand up to rain, wind, and snow. Height adjustment uses a crank that needs to be turned by hand, which, although easy to use, takes some time to make large adjustments. Despite included wheels on the base, the hoop is difficult to move from place to place. 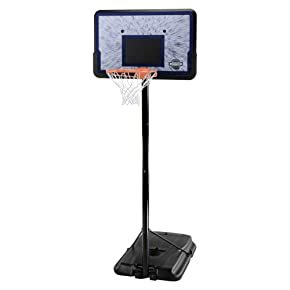 Improving players, such as growing kids, may find that the 44” backboard is too small over time for competitive games or practicing difficult layups. Setup is difficult as a result of poorly illustrated instructions. Acrylic backboard does not provide the quality of rebound found in the acrylic used in the Spalding NBA Hybrid and will scratch during use. Very quick to set up and break down thanks to numerous parts coming pre-assembled and the “Quick Play” design that requires fewer tools and screws. Easy to move from place to place thanks to a wide drain to empty the base of water and a wheelbarrow wheel design on the base that makes it possible for a single person to transport the hoop over short distances. Backboard looks clean and sleek thanks to the unique framing approach used, in which the corners are slightly folded back and the remainder of the backboard is left without a steel frame. 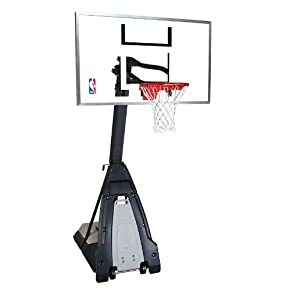 26” offset between the backboard and base is more play area than offered by many similarly priced and more expensive hoops. Available in 50” and 54” acrylic backboard sizes depending on budget and available play area. Height adjustment mechanism is easy to use, but only allows the net to be moved up or down in increments of several inches at a time. Breakaway rim uses a single rather than double spring mechanism, which reduces the hoop’s utility for dunking practice. Acrylic backboard will scratch over time. Low minimum height – 3.5 feet – is perfect for small kids just learning to play or for use as a poolside basketball hoop. 33” polycarbonate backboard is shatterproof and looks more professional than other plastic backboards. Includes a breakaway rim that, combined with the height adjustability up to 7 feet, is perfect for practicing dunks. Base is stable enough for dunking, yet the integrated wheels and light weight of the overall hoop make it easy for a single person to move the hoop around. The 7 foot maximum height is extremely low if trying to use this hoop for the occasional game among adults. Construction of the frame is not very durable, as the pole can rust if left outside and the hollow construction of the pole makes it susceptible to breakage. Height can only be adjusted in pre-set increments and there are very few increments between 3.5 and 7 feet minimum and maximum heights. There is very little offset between the backboard and the base, making it difficult to play competitively close to the rim or practice layups. 43” wide plastic backboard is large enough to practice layups and play somewhat competitive games. Plastic backboard and rust-resistant steel frame make this hoop extremely durable. 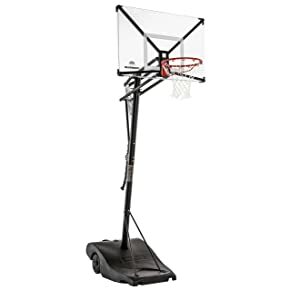 The base is sturdy enough for most uses, including dunking, while the integrated wheels make it easy for a single person to move the hoop around. Height is adjustable from 6.5 to 10 feet for different groups of players. Plastic construction greatly reduces the price of this hoop compared to hoops featuring acrylic or glass backboards. Small size allows this hoop to be used in many locations, including indoors. Height adjustment uses a knob that has to be screwed in to pre-drilled holes, making it time consuming to adjust the height and impossible to adjust the height in small increments. Rim is mounted directly onto the backboard without a breakaway spring, such that it is possible to break the rim if dunking or playing aggressively. Plastic backboard looks cheap and unprofessional relative to other plastic backboards on the market. Many customers receive hoops with manufacturing issues, such as missing parts or a cracked base. Net is not constructed of weather-proof material and cannot be left on the hoop during bad weather. Steel frame and impact-resistant plastic backboard make this hoop virtually indestructible. Wheels mounted in the base make it easy to move the hoop around. Because of its small size, the hoop has a very small footprint and can even be suitable for large rooms indoors. Height is adjustable from 6.5 to 10 feet. Plastic backboard is 44” wide, similar to significantly more expensive hoops, and is great for beginners. Low price makes this a budget-friendly option for purchasing a portable basketball hoop. Rim is mounted directly to the backboard rather than incorporating a breakaway design, so that it can be ripped off the rim during aggressive usage and require remounting or replacement. Height adjustment uses a screw-knob, which can be difficult to align with the pre-drilled holes and means that the height can only be adjusted in approximately 1 foot increments. Although the base is stable enough for routine use when filled with sand, the hoop is not stable enough for dunking or aggressive play. Plastic backboard looks cheap and unprofessional. Net is not weather resistant and will degrade over time if left outside in inclement weather. Relative to other plastic construction hoops on the market, the Pro Court is highly adjustable in height with 6” increments from 7.5 to 10 feet using pre-drilled holes. 44” backboard is extremely durable and resistant to severe weather due to plastic construction. Base is sturdy enough for dunking when filled with sand, yet easy to move around without assistance thanks to the included wheels. Plastic construction greatly reduces price, making this extremely low cost compared to hoops with acrylic or glass backboards. Installation is simple and, aside from mounting the backboard, can be done by single person. Plastic backboard design does not look professional. 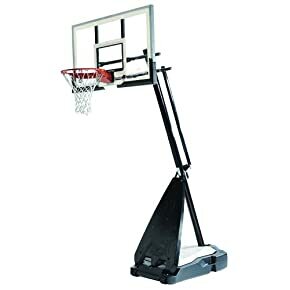 Rim is mounted directly to the backboard, reducing the hoop’s usefulness for dunking since that force applied directly to the rim can snap it off the backboard. Height adjustment uses a screw knob, which can make it difficult to find the pre-drilled holes and add time to adjustments. Minimum 7.5 foot height makes the hoop somewhat inaccessible for kids or beginners. 54” acrylic backboard gives the ball a solid rebound and provides plenty of room for practicing layups or playing competitive games. Features a Power Lift height adjustment, which is extremely easy to use as it requires only lifting a spring-loaded lever up or down slightly to make adjustments in any increment from 7.5 to 10 feet. Holds up well to dunking thanks to a reinforced wrap-around rim, similar to that found on professional basketball hoops, and the breakaway spring-loaded design. Base is large enough to hold several 50-pounds bags of sand, keeping the hoop stable even during dunking and aggressive play. Set up is easy and fast compared to hoops from other manufacturers and Lifetime is well-respected for their responsive customer service if issues arise. Base has wheels included, but the weight of the hoop is such that it is not easy to move around. 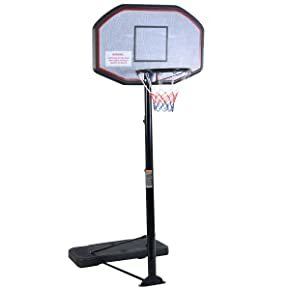 Offset between the backboard and base at full height is only 13”, significantly less than that of competing hoops of similar construction and price. Acrylic backboard is prone to scratching over time and extended use. Portable basketball hoops are a great way to practice your game at home, without the hassle of finding an open court. These hoops are reasonably affordable, and come in a wide variety of styles to fit most budgets. When choosing a hoop, be sure to take a close look at the backboard, rim, and support system for any hoop based on your anticipated needs. With that in mind, the seven hoops listed here are some of the best options available and will have you out improving your game and playing pickups in the driveway in no time.